No other green vegetable heralds the beginning of spring quite like asparagus. Learn how to choose the freshest bunch, how to store it and how to cook asparagus with our helpful tips. Although now available year-round thanks to imports, asparagus is still most plentiful and reasonably priced from early March through mid-summer when domestic crops are harvested. This popular vegetable is a member of the lily family and ranges in color from green to purple to white. Green asparagus is the most common U.S. variety. Although most of our asparagus recipes feature cooked asparagus, this gorgeous green veggie can be served either hot or cold in side dishes, salads, as pizza toppings or in stir-fries, pasta dishes, quiches and omelets. Before you learn how to cook asparagus, you must know how to choose the perfect bunch. Select firm, bright green spears with tight, dry tips. The cut ends should look freshly cut, not dried out. Avoid bunches with wilted spears, open tips and a strong odor. In the supermarket produce department, asparagus bunches should be displayed upright with their bases in water to maintain freshness. Although best when used the day of purchase, asparagus can be refrigerated upright in a container of shallow water covered with a plastic bag for up to 4 days. Rinse asparagus spears well under cold running water just before using. Bend the cut end of each spear until it snaps off naturally; discard the tough end. If the spears are still tough or fibrous, remove the outer layer with a vegetable peeler. Cook spears whole or cut diagonally into 1-inch pieces. 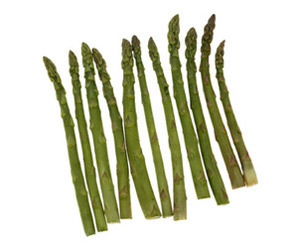 Asparagus can be steamed, boiled, roasted, microwaved, stir-fried, grilled and sautéed. Avoid overcooking to prevent loss of flavor and color. If serving the asparagus cold, plunge it immediately into cold water to halt the cooking process after steaming, boiling or microwaving. Drain and pat dry when cool; do not soak in the water. Toss diagonally sliced asparagus pieces into your favorite stir-fry. Top a pizza with tender asparagus tips before baking. Add cooked asparagus pieces to omelets, quiches and casseroles. Brush asparagus spears lightly with olive oil and grill or roast for great smoky flavor. Tuck cooked, chilled asparagus spears into a crudités platter and serve with a creamy dip. Sprinkle cooked spears with KRAFT 100% Grated Parmesan Cheese or toasted PLANTERS Walnuts or Almonds before serving.